Facebook has given fan page administrators a new level of control over the content on their walls.A new setting allows you to automatically filter profanity posted by fans, All Facebook reports. To enable the setting, visit the fan page you administer and click Edit Page, then Manage Permissions. 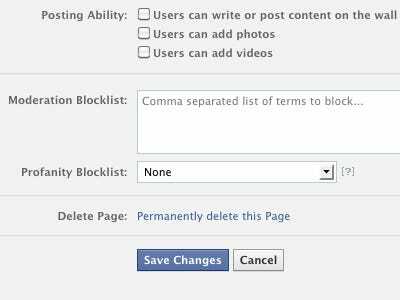 You’ll be able to enter specific words you would like blocked from your page and set how strongly you want Facebook to filter out profanity. There are three levels to choose from with varying levels of protection: light, moderate, or strong. If you run a Facebook page for a family-friendly brand or just want to keep out foul-mouthed commenters, this is worth a look.